It's not officially winter yet but we had a hard frost in Seattle the other morning and I-90 was closed at Snoqualmie Pass due to heavy snowfall. 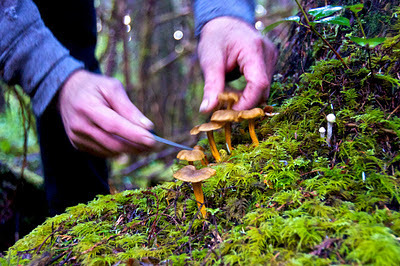 Most mushroom hunters figure, "Put a fork in the season. It's done." Not so. 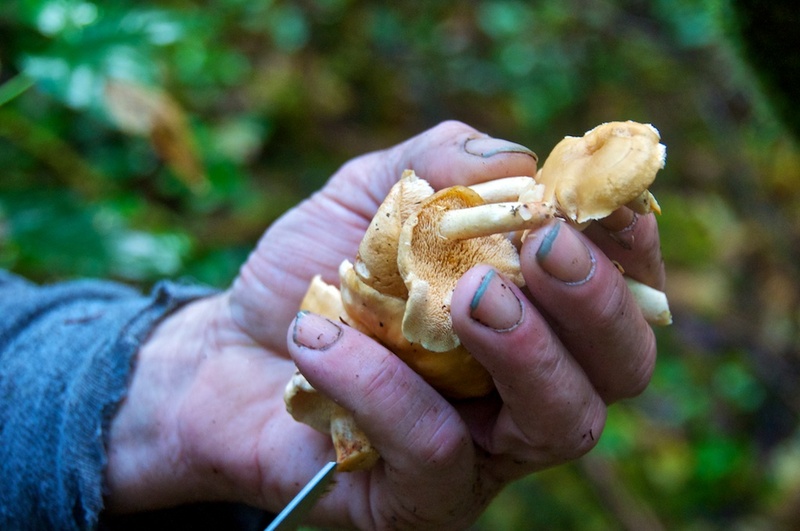 This is the time of year to find cold-loving species such as hedgehogs and winter chanterelles (aka yellowfoot). Look for them in wet coastal woods where there's plenty of decay. 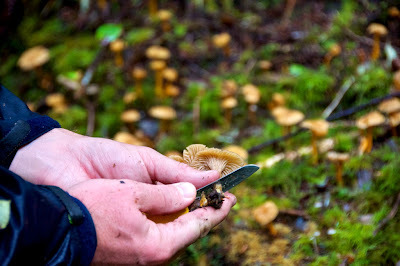 Recently I went picking with a friend on the Olympic Peninsula. Though not an epic year for late-season mushrooms (or any mushrooms, for that matter), we found decent numbers of bellybutton hedgehogs (Hydnum umbilicatum, pictured above and left) and spreader hedgehogs (Hydnum repandum). They're easily told apart. The bellybuttons are smaller, with proportionally longer stems and an "inny" of a bellybutton at the center of the cap, technically referred to as umbilicate. The spreaders can be much larger, with caps that develop scales or cracks. Both are delicious, with spicy hints of black pepper, nutmeg, and cardamon. Being fairly cold-tolerant, they'll last a long time in your fridge, too, often more than a week. 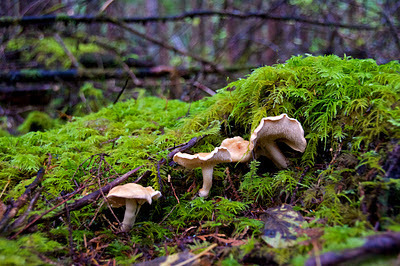 Yellowfoot chanterelles (above), also known as winter chanterelles, are not actually in the chanterelle genus; rather, they're considered a species of Craterellus, the same genus as black trumpets, and like that mushroom, they too are hollow, though with chanterelle-like ridges underneath the cap. In the Pacific Northwest our species is currently called Craterellus tubaeformis but may be changed to C. neotubaeformis as it appears to differ from the species found in the Eastern U.S. and Europe. Either way, yellowfoots have good chanterelle-like flavor despite their insubstantial size, and when they're on, you can pick them by the handful. 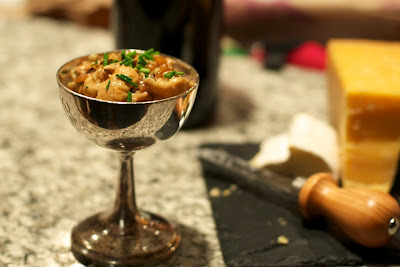 Recently I made two appetizer dishes with winter mushrooms. One was a crostini with yellowfoot and chicken liver. The other was a very rich and savory mushroom parfait of sautéed hedgehogs and yellowfoot with wheat berries and mascarpone. The crostini was inspired by a meal I had at Jeremy Faber's house. Jeremy is the owner of Foraged and Found Edibles in Seattle and I think he served this dish because I had been bad-mouthing yellowfoots as soggy, tasteless chanterelle wannabes. He showed me that with the right approach, you can actually get a lot of flavor out of them, and despite the flimsy, wet noodle posture, they have good texture when properly cooked. Brown a small handful of chicken liver in vegetable oil. Remove from the pan and crumble with the help of a potato masher. In the same pan, sauté a few big handfuls of whole yellowfoot mushrooms and deglaze with a healthy splash of soy sauce. Cook the mushrooms down in the soy until they release all their water and they're brown. They'll look almost like weird, squid-like tentacles. No need to add salt because the soy will be plenty salty; in fact, you might want to use a low-sodium variety. Mix back in the crumbled liver and serve over sliced and toasted baguette with a sprinkling of chopped parsley. The result is a serious umami bomb. For the parfait, first prepare the wheat berries on the stove top. No matter how long you cook them they'll retain an al dente texture. I used three cups of chicken stock for a cup of berries and simmered in excess of an hour. This was much more than I needed. Next sauté a half-pound of chopped hedgehog and yellowfoot mushrooms in butter with a generous variety of chopped herbs (I used thyme, sage, and oregano). Season to taste. Remove to a bowl and mix in a few dollops of mascarpone. The mixture should be super creamy. Now mix in enough wheat berries so that the ratio is about 3:1 in favor of mushrooms. Serve in goblets with a sprinkling of chives on top. The season's not over for those of us north of Oregon. Get out there and find some mushrooms. yum! what elevation do you usually find chanterelles at? 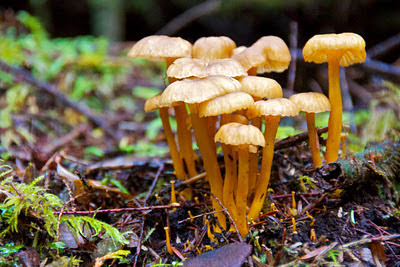 VGCHM - Look for winter chanterelles (yellowfoot) at low elevations in the coastal ranges. I've found them in the Cascade foothills and mid-elevations in the old growth, too. I would love to have the opportunity to go and pick my mushrooms from the forest, but I live in a busy town. I'm out in the Chicago area, but we get excited about winter harvest, too ... found three large clusters of tan oyster mushrooms yesterday, almost 5 pounds worth! They were frozen solid, which actually worked out well - it was a long hike back to the car and being frozen they didn't get all broken up in the sack. Had to be patient when cooking them though - once thawed they were even more wet than usual. What a treat! Elena - Even busy towns have wild edible mushrooms. I pick birch boletus (a type of porcini) two blocks down the street from my home in Seattle. Go get 'em. Yum! That dish you made is so mouthwatering. 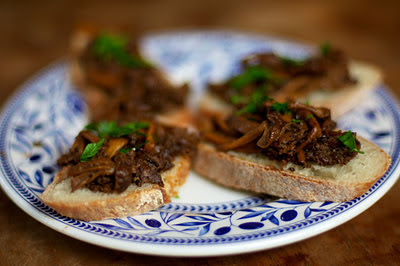 I have tried quite a number of mushroom dishes, but not the winter chanterelles. Oh, I wish I can try them one time. Picked about 40 lbs. of Yellowfoots last week.... half of them popsicalshrooms... But Thawed out nicely. Crop is only about 1/3 of last year, But lots of little ones pinning. I find them with my friend near a coniferous area with a moist pillow mossy and swampy lowland no closer than a meter or two from the swamp, but not further than 20 meters away and never on dry land or foothills. Seems to like very moist areas where there are a lot of coniferous logs decomposing and plenty of moss. I find mine in Quebec inside parc de la riviére Doncaster and there are always both hedgehogs and winter chanterelle.